Have you ever gotten a document from someone in Google Docs that had a different page color, only for you to go and print it and see that it actually prints with that color? Or maybe you are designing something like a newsletter or a flyer, and a color other than white would be preferable for your document. 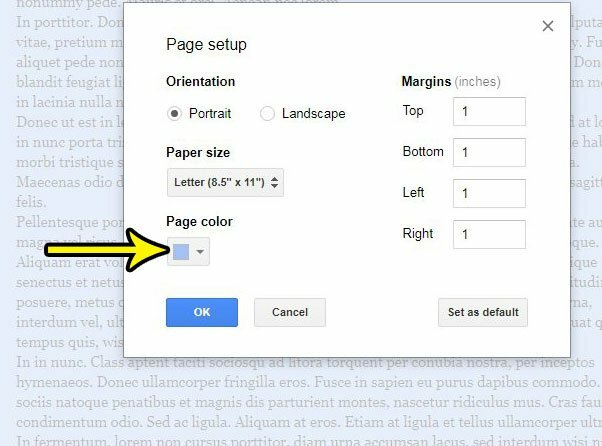 Fortunately the page color is a setting in Google Docs that you can customize, whether you want to add a little extra pop to your document, or you would prefer a more neutral page color than the one that is currently set. 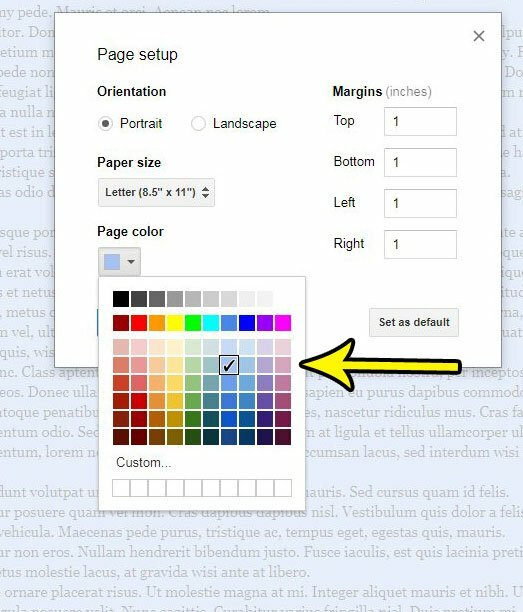 Our tutorial below will show you where to find and change the page color setting in Google Docs. The steps in this article were performed in the desktop version of Google Chrome, but will also work in Firefox and other similar desktop Web browsers. 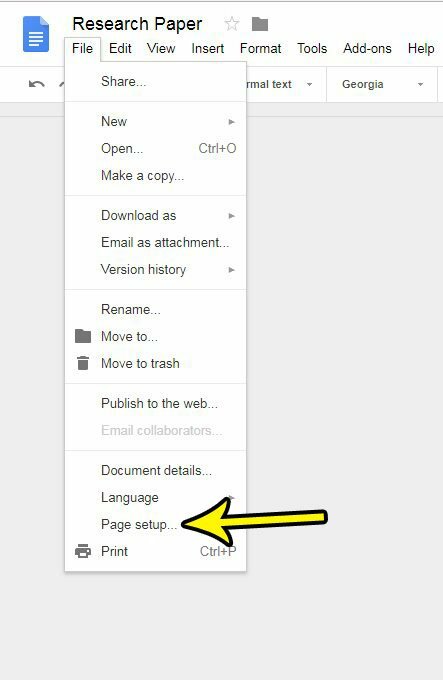 The steps below are going to show you how to find the setting in Google Docs that controls the color of the page for the current document. This will not affect your defaults (though you can choose to set it as the default, if you wish), nor will it change the page color for any of your existing documents. 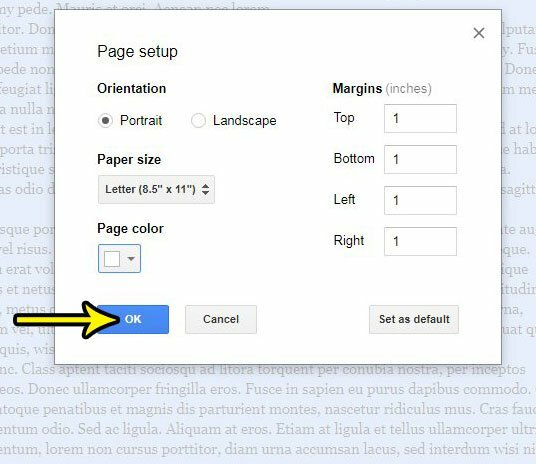 Note that Google Docs does print the color that you select for your page color, so you might want to stick to the default white color if you don’t want to use a lot of ink. Step 1: Sign into your Google Drive and open the Docs file for which you want to change the page color. Step 2: Click the File tab at the top of the window, then choose the Page Setup option at the bottom of the menu. Step 3: Click the Page color button. Step 4: Select the page color that you want to use for the document. As mentioned earlier, you can check the box at the bottom-right if you want to make this the default page color for all future documents. Step 5: Click the OK button to apply the change. Do you need to format your document by including your name and page number? Find out how to add your last name and page number to the header in Google Docs so that this information repeats at the top of every page of your document.